NABDAM DISTRICT, Ghana, July 11, 2018 /PRNewswire/ — The African Bicycle Contribution Foundation (ABCF), a U.S.-based 501(c)3 non-profit corporation, today announced that it has recently distributed 50 additional Ghanaian-made bamboo bicycles, in the Nabdam District, northeastern Ghana. 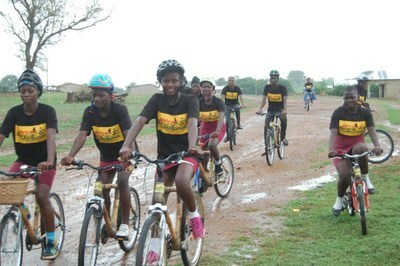 Forty of the bicycles, manufactured by the Kumasi-based Ghana Bamboo Bikes Initiative (GBBI), were contributed to girls, ages 13-18, who attend the recently established Girls Model School in the District; an additional four were distributed to farmers, four were contributed to teachers, and two bicycles were given to healthcare workers. 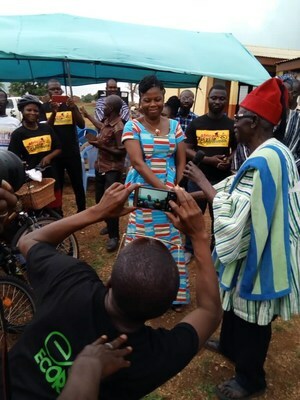 The Nabdam District event included ABCF’s 290th bicycle distributed in Ghana, since the foundation’s inception. Ghana’s Nabdam District, which is bordered on the north by Burkina Faso, and on the east by the Republic of Togo, is the least urbanized region in Ghana. Less than 16 percent of the population resides in urban areas, and about 28.5 percent of adults in the region are classified as illiterate. Additionally, 84.9 percent of the employed population is engaged in skilled agricultural, forestry and fishery occupations, and 50.3 percent of the population is self-employed. Notably, nearly one-third of the local residents live approximately 15 miles from the closest hospital, and the students at the Girls Model School travel a minimum of 9.3 miles each day, on foot, to and from school. Also notable is the fact that, in Nabdam, the proportion of males who have attended schools is consistently higher than that, for females, at all levels. 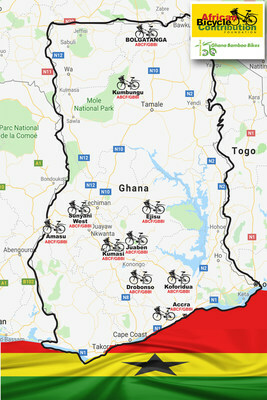 A UNICEF report on the impact that bicycles have for school-aged Ghanaian girls, found that 95 percent of rural girls attend school more regularly after having gained access to a bicycle, and 70 percent of those who received bicycles demonstrated higher academic performances, in their subsequent school work. Commenting on the Nabdam District event, the Foundation’s executive director, Patricia Marshall Harris, stressed the important role GBBI CEO Bernice Dapaah, and her leadership of her Ghana-based company, with a predominately Ghanaian female workforce, can play in inspiring young women at the Girls Model School to achieve Ghana’s national aspirations for academic, economic and social advancement for women across the country. 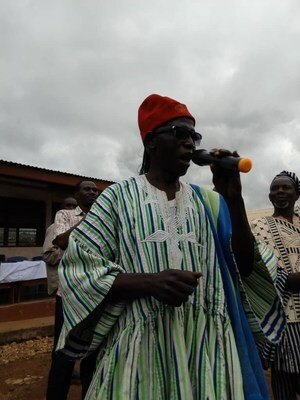 At the event, which was held at Kongo, in the Nabdam District, remarks were presented by Mr. Timothy Naasal Yuornuo, district director of education; by Kongo-Sapaat-Nab Namaalteng, chief of Kongo; by Mrs. Meiri Seidu, director, Health Directorate; and by Mr. Amos Agyapong, production manager, GBBI. The event, which also included a Girls Model School Cultural Display, was moderated by Mr. Francis Sapaat and the opening and closing prayers were offered by Rev. Martin, a Roman Catholic priest. ABCF works in partnership with the Ghana Bamboo Bikes Initiative, which produces the iconic Eco-Ride bamboo bicycle; the Bright Generation Community Foundation, the Respect Alliance, and the U.S.-Ghana Chamber of Commerce. Included among the foundation’s corporate and charitable non-profit sponsors are Independence Blue Cross, the Omega Omega Chapter of Alpha Kappa Alpha Sorority and Dr. and Mrs. Colon A. Romero. For further information about ABCF, please contact the ABCF offices: info@africanbike.org.